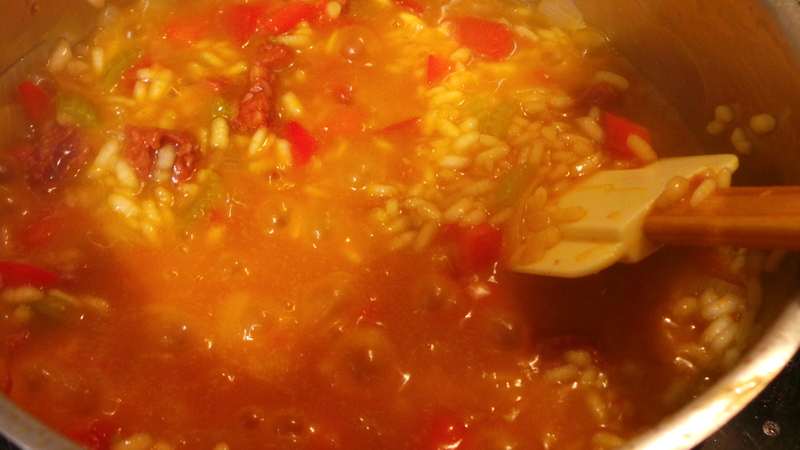 Risotto is a word that can send chills cascading down a beginner cook’s spine. The sheer expectation that their rice is to be done to perfection may dissuade them from even trying this dish. Add to that the clear and certain knowledge that it requires boiling hot stock, added ladle by ladle, all while stirred ad infinitum and who’d actually bother? I don’t. In fact I find it hard to believe that any self-respecting Italian peasant mother with many small children underfoot would be able to pull that particular feat off satisfactorily. 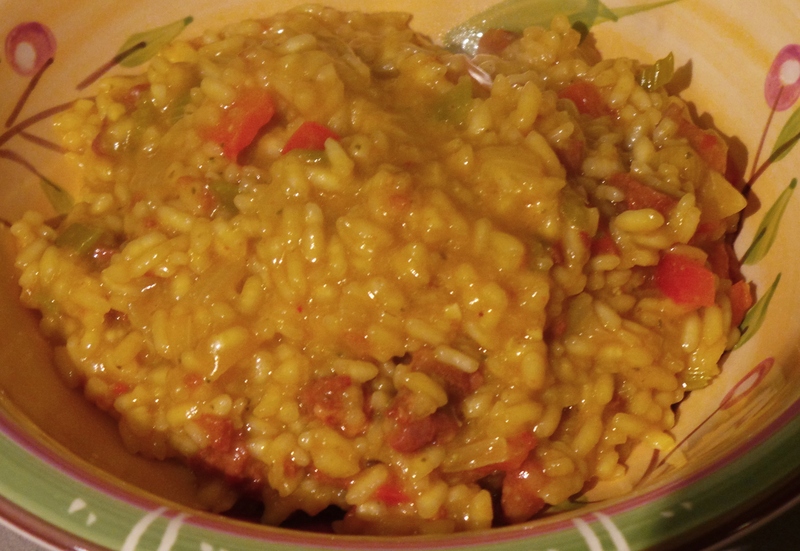 Don’t be confused here – risotto was a peasant, or farmhouse dish, long before it was ever gourmet. 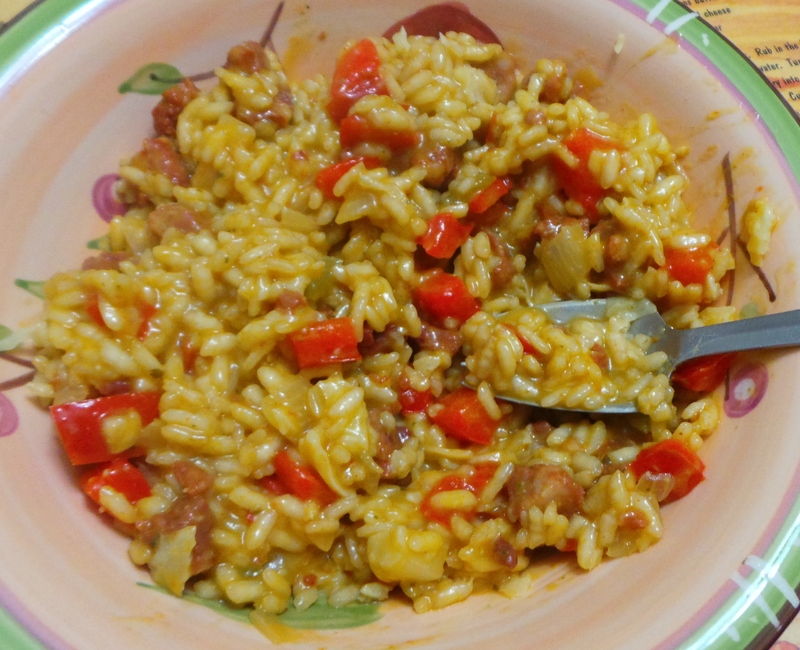 In my kitchen, risotto is a way to mix quite a few different vegetables (or bits of vegetables) and a little meat into a warm, creamy, comforting bowl of hot, moist rice. These ingredients will make me a risotto. 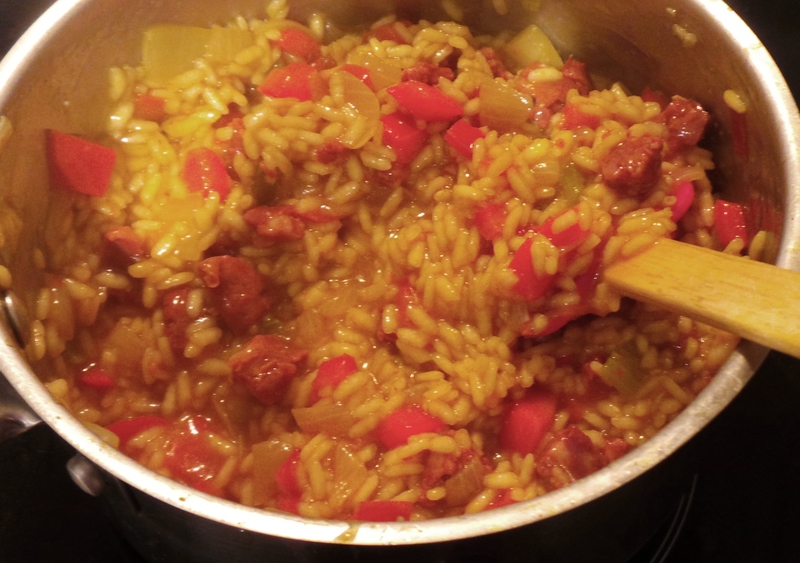 I’m calling this cheat’s risotto, because it’s how I make a risotto-like dish. It works for me and I hope it works for you. To make a risotto you need a short grain rice. The most common one available to shoppers in my neck of the world is Arborio rice. You can find it in most supermarkets. 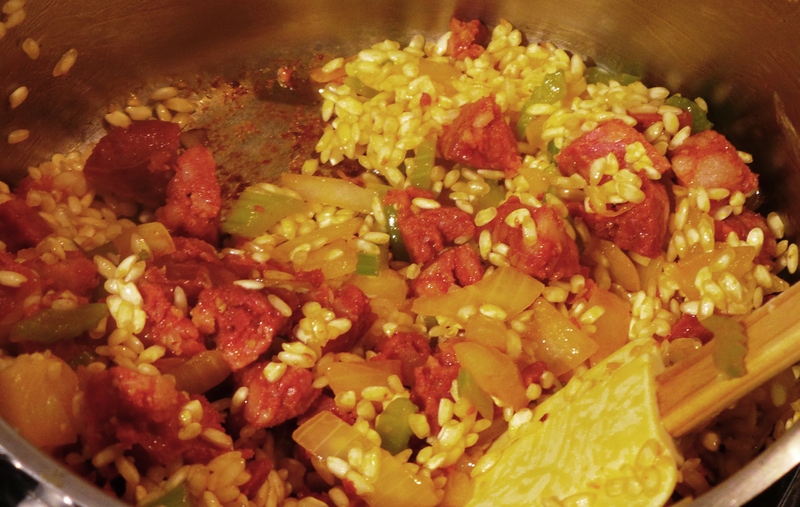 You can do this with Pearled Barley too, but it will take about 45 minutes to cook. You also need a largish saucepan and a good quality stock. In the picture above, you’ll see a mason jar in the centre. That there is my home-made chicken stock. You don’t have to make your own. Use a stock cube if you wish, or bouillon, or a tetra pack – whatever works for you. Just make sure that whatever you use has a good flavour, because this is what your entire dish will taste of! Bear in mind that, if you do make your own, it will contain far less salt than the processed alternatives. I had a few bits and pieces I wanted to use up, so that’s what’s gone into this meal. 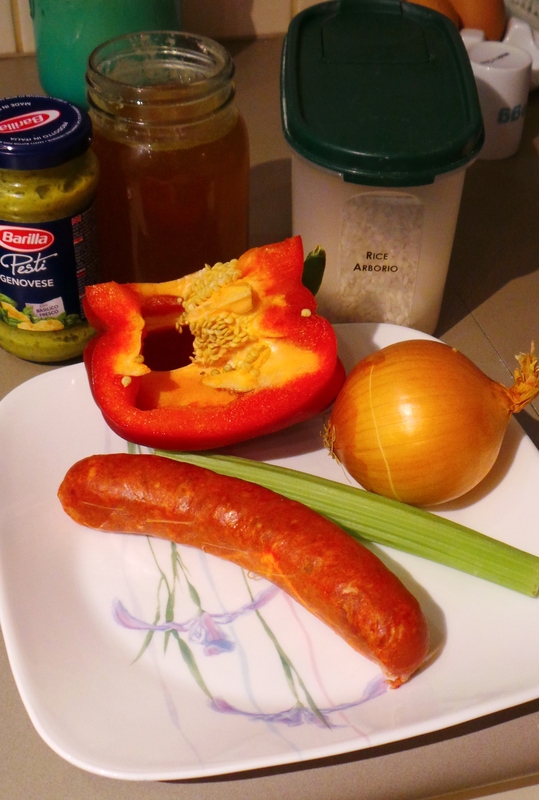 An onion, a stick of celery, half a large red pepper and a chorizo were all pressed into service. 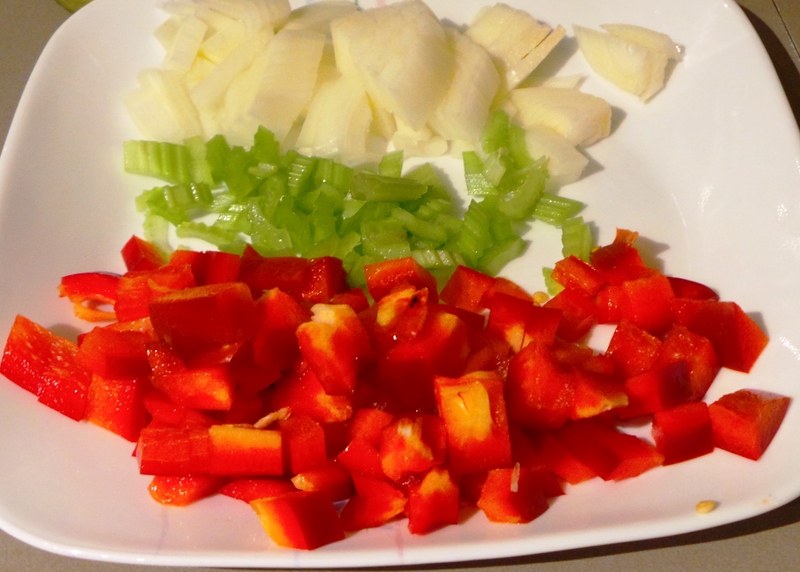 I started by chopping them up as finely as my motor skills would allow – which wasn’t very. While I was doing this, I poured the chicken stock into a microwaveable jug and heated it to boiling point. Then I put my saucepan on the hob on lowish heat and prepared for action. A splash of olive oil went into the pot and the onion was added and cooked until translucent, accompanied by a spoonful of garlic from a jar. 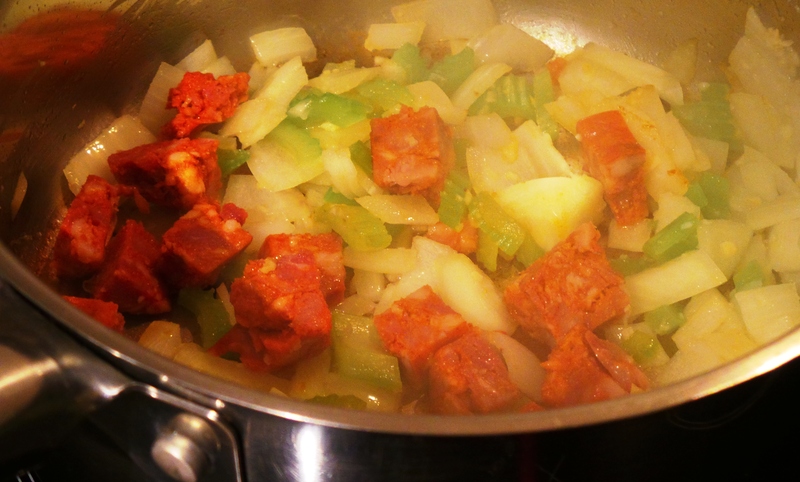 Then I added the celery and, when that was soft, I added the diced sausage. I decided to add the capsicum later for a bit of a texture contrast. The stock is brought to the cooking area now and the kettle is boiled just in case I want more liquid later. Now is the time to add the rice. I very rarely measure it, but I guess I use about 1 cup for the two of us. Add the rice all at once. 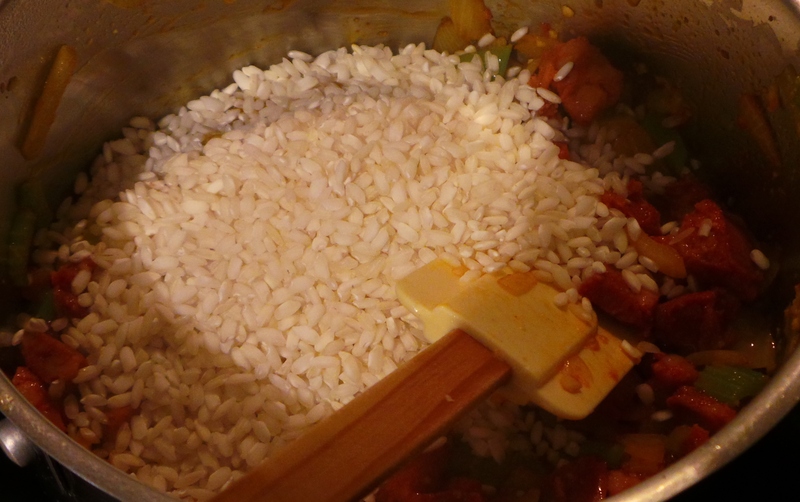 When the rice is added, it is very important to stir it vigorously. 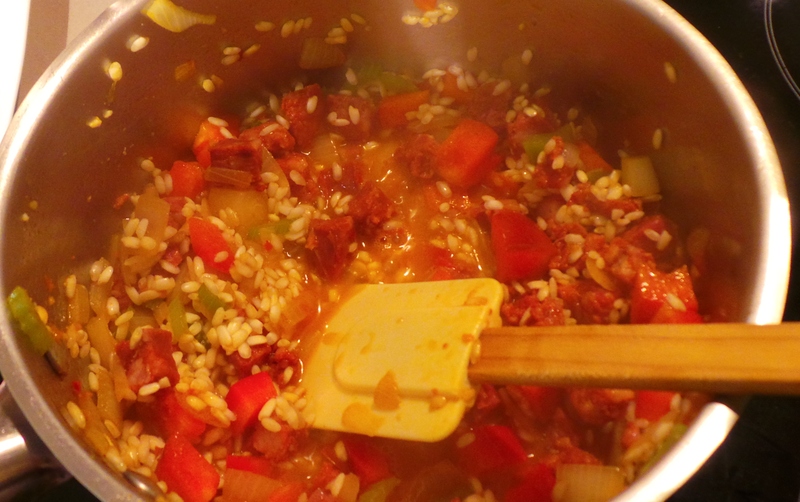 You are aiming to coat the rice with whatever oil and juices are already in the pan while also toasting the grains. I added the capsicum here. I also set the kitchen timer for 15 minutes. Then I added a good amount of stock – probably about 3/4 of a cup. Basically you want enough to cover the base of the pan and to come at least half way up your ingredients. Stir as thoroughly as you can until the stock is almost completely absorbed. Start adding your stock a bit at a time. The more you stir at this point the more the starches in your rice will be released, and the smoother and creamier your final result will be. Keep adding stock a little at a time until you’ve used about half of it. Then you can safely just add the rest. Did you hear the sound of millions of chefs fainting just then? Seriously, just add the rest of the stock. It will look like you’ve drowned it. It’s okay. Really. Keep it simmering gently and stirring it to prevent sticking. If the rice emerges from the liquid before your kitchen timer goes off, then add some water from your previously boiled kettle. You need your rice to be cooked! You *will* see your rice again. You want your rice to be al dente. Remember that it will continue to absorb water after you have taken it off the heat. So, while it is still on the hob, run your spatula along the middle of the bottom of the pot. You should see clear saucepan and then a sheen of liquid will appear. That is what you are after. Serve this pot of yumminess. Traditionally, the dish is ‘velveted’ by adding cream at this point. I fear my hips would enjoy that too much, so I don’t do it. I sometimes add a tablespoon of basil pesto to change things up a little, but it isn’t necessary. You can also stir cheese through at this point, but this adds a degree of difficulty to the clean up of the saucepan. A sprinkling of parmesan is really all that is needed. 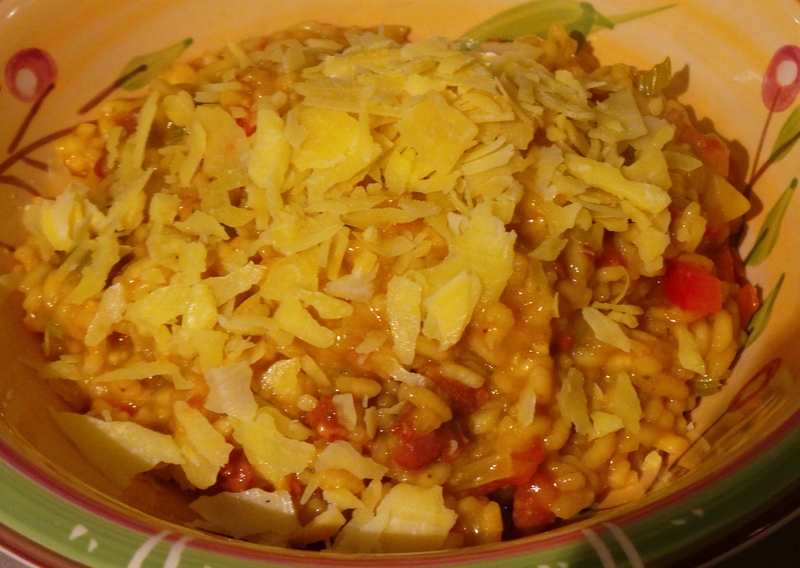 I serve the rice, then add a sprinkling of shaved parmesan cheese and a grinding of black pepper and it is perfetto! At some point in the future I’ll redo this post with pics of the food in white bowls and under better lighting, but until then you’ll have to trust that this is delicious.